Rs 1 Lakh w.e.f 01.04.2012. AIC unanimously decided to increase the monthly subscription from Rs 40/- to Rs 70/- w.e.f 01.04.2012. 17.04.2019 AGSs P.P.Rao and Sanjeev met Sr GM Establishment Sh Saurabh Tyagi and discussed on the issue of GTI. He assured to look into the issue. View Copy of the letter of GS to GM training regarding GTI deduction. Further it was also informed that the Pension Contribution on actual basis is pending in Ministry of Finance (MoF) and they are trying to meet the concerned Officers in MOF. 14.04.2019 SNEA AP pays it's respectful homage to Dr.B.R.Ambedkar, on the occasion of his 128th birth anniversary. 10.04.2019 Guidelines relating to transfer and posting - rationalisation of expenditure reg. Board level and below Board level posts including non-unionised supervisors in Central Public Sector Enterpries(CPSEs)- Revision of Scales of Pay w.e.f. 01.01.2007 - Payment of IDA at revised rates regarding. 02.04.2019 SNEA AP extends best wishes for all comrades who retired on 31.03.2019 on superannuation, for a happy and peaceful retired life. Comrade you are starting a new journey and exceptional chapter of your life. May your days be filled with elation and triumph. We thank you for your dedication & congratulate you on your retirement. Systemic and meticulously calibrated decimation of the strategic PSU, BSNL, by the Government, covertly and overtly aided and abetted by the regulator TRAI, Digital Commission, and coveted National policy framing body - the Niti Aayog. All tacitly colluded to ensure that R-Jio somehow becomes the monarch of precious Data at the cost of allowing Telecom Sector to perish and adversely impact the health of the PSBs. BSNL took birth on 01.10.2000 as a matter of policy compulsion, consequent upon opening up of telecom sector to the private capital as a sequel to implementation of National Telecom policy promulgated in 1995. Since birth of BSNL, successive Governments used it as a milking cow to meet social obligations of the Telecom Policy in an extraordinary manner, meeting the fundamental and envisaged objective of National Telecom policy set out in 1988 by the first Telecom Commission of the Country - Affordable Telecom Services of Universal Quality. In meeting this ordained Telecom Policy objective of the Government, BSNL never looked back while incurring incredibly huge losses. While BSNL was forced to provide telecom services in the remotest inaccessible areas of the Country, the concrete policy commitments that were made by the Government to support BSNL to provide services in these highly unremunerative and loss making areas systematically and gradually started getting eroded. Access Deficit Charge(ADC) and USO Fund Subsidy were arbitrarily stopped, IUC charges were drastically slashed, private operators were allowed to change over from fixed license fee to revenue sharing etc etc. Govt. did not allow BSNL to start mobile services till 2002, giving strategic market advantage to early movers like Airtel. All these policy breaches by the Govt. adversely and irreversibly hit the revenues of BSNL, and jeopardized the growth of the incumbent operator. Even though BSNLs entry in highly potential mobile segment was delayed by more than two years, BSNL came very close to the then leading mobile service provider, Airtel, in terms of mobile market share in the year 2006, when the then Telecom Minister directly interfered in the mobile tender process and, at the behest of vested interest equipment manufacturers, canceled 45.5 million mobile tender that was finalized in a highly transparent manner. Even thereafter, the story of destabilizing BSNL continued unabated when BSNL was not permitted to procure mobile equipment from Chinese vendors who become the successful bidder in the tendering process, for 3 years, citing flimsy and non -existent security considerations while freely allowing private operators to procure equipment from same Chinese vendors. This is how politicians and Ministers, all together lined up to finish BSNL and allow private operators to flourish. These cohesive and committed efforts of the Management and the workers which produced tangible results forced Prime Minister to declare at the Red Fort that BSNL is on recovery path and has started making profits. Also Minister Of Communications repeatedly assured in the Parliament and the employees of BSNL that Govt. is committed to support BSNL. But these shallow declarations and commitments of the PM and the MOC ran completely counterproductive and contrary to what has been visible on the ground - well planned and systematic extinction of BSNL to create enough space for vested interests to grow, flourish and capture fertile telecom market. It was just unbelievable to find PM crossing all the limits of propriety and officialdom by taking up the mantle of promoting the launch of R-Jio, virtually acting as its brand ambassador. Public posturing by the Govt. regarding revival of BSNL is fully and publicly unmasked after witnessing how policy has been tweaked and brazenly breached to ensure that Reliance-Jio makes forays into fertile telecom market. Following chronological sequence of events clearly establishes the nexus of top policy makers of Telecom in the Government with the well identified vested interests to enable them to grow by hook or by crook, and also leaves no one in any doubt whatsoever about diabolical intentions of the Govt. to consign this great telecom company of the Country to flames. 1. Premeditated appointment of Shri R S Sharma as TRAI Chairman to allow R-Jio to blossom and capture telecom market: Handpicked appointment of Shri R S Sharma as Chairman/TRAI and his subsequent extension for another two years has facilitated the Govt. to accomplish what it wanted – unhindered and unquestioned growth of R-Jio and decimation of telecom market, particularly BSNL. The way he allowed predatory pricing indulged in by R-Jio to continue unabatedly raises very big questions about his professional integrity and establishes that he fulfilled the agenda for which he was roped in. The way he changed the definition of “Strategic Market Player” and thus paved the way for R-Jio to illegitimately capture telecom market also establishes his loyalty to his political masters. The decisions that TRAI has taken under R S Sharma’s infamous leadership not only decimated telecom sector in the country but also jeopardized growth of PSBs whose good public money of nearly 6.10 lakh crores got converted into NPAs because private operators explicitly warned the Government about their inability to service the loans of PSBs because of the so called deadly effects of predatory pricing on their revenues. 2. Shifting of Telecom Minister Shri Ravi Shankar Prasad just before the launch of R-Jio as Telecom Minister who openly supported BSNL: Shri Ravi Shankar Prasad as Telecom Minister openly supported BSNL at every level. Just before the launch of Reliance –Jio, he was divested from the charge of Telecom Minister and a very junior Minister of State was given just additional charge of Telecom. An honest officer having highest professional integrity and concern for the Telecom Industry, strongly opposed the predatory pricing of Reliance-Jio and the stand of TRAI, justifying the predatory pricing. Smt Arundhathi Bhattacharya, the then SBI Chairman was the first to signal the alarm bells, mentioning the stress in Telecom Industry, growing NPAs and urgent need for corrective measures. As Chairman Telecom Commission, Shri J S Deepak took stand to protect the industry and urged upon Chairman, TRAI to stop the predatory pricing of Reliance Jio because of its deadly consequences to the whole Telecom Industry. The result of his tough stand against predatory pricing was that he was unceremoniously removed from the position of Chairman/TC. 4. Niti Aayog recommendation to Close down BSNL and MTNL: The sole objective of Niti Aayog is to garner as many resources as possible through sale of PSUs and BSNL is not an exception. The highest policy making body that ought to be fully engrossed in formulating a comprehensive road map for growth of vital sectors of Indian economy is preoccupied by such ticklish and parochial issues. Revival of BSNL is not even their agenda, rather their eyes are on the money going to get on disinvestment or sale of BSNL once BSNL become sick! 5. Non allotment of 4G spectrum: Non allocation of 4G spectrum is a very calculated and motivated move of the Govt. aimed at allowing R-Jio to capture fertile data market in the Country. All the operators, except BSNL launched 4G services two and half years back and captured the market. BSNL already lost the edge in competition. For 4G spectrum, in consultation with DoT, a detailed Project Report was approved by BSNL Board and submitted to DoT in December, 2017. Anticipating 4G spectrum, BSNL spent hundreds of Crores of rupees and procured the 4G equipments but dumped in store. Other operators are working towards 5G whereas BSNL is not even allotted 4G spectrum by the Govt, the 100% owner of BSNL. Without 4G services, how BSNL can compete with other operators in the market? If it would be the case of a private operator, whether the Minister and the bureaucracy in DoT would have had the courage to delay the proposal like this? 6. Non-filling of Director (Fin) and other Director posts of BSNL for years together. This is a clear indication of Govt’s step motherly treatment for BSNL. This created policy paralysis and delayed decision making in BSNL which in turn resulted in negative growth. DIR(Fin) post is vacant since December, 2013 and DIR(HR) was given additional charge. Net result is that neither the responsibility of DIR(HR), nor the responsibility of DIR(Fin) is being met by the same person. DIR(CM) post is vacant since July 2018. DIR(EB) and DIR(HR) are retiring during March and April, 2019. For the revival of BSNL, just one Director will be there in BSNL from May, 2019 onwards instead of five! 7. Govt projects NOFN, NFS, LWE etc allotted to BSNL without much returns, forcing BSNL to bleed. BSNL attention is diverted from the core Telecom business to these Govt projects as the Hon Minister and Secretary DoT is constantly and directly, monitoring the progress. In none of such meetings, they reviewed the performance of BSNL in the respective Circles. CGMs are more concerned about the Govt projects at the cost of BSNL services. BSNL resources are largely diverted for these projects including manpower, stores, vehicle, resources etc. In return, BSNL is getting paltry amount for implementation of these projects. For NFS Project, implementation charge was originally 7.5% (Rs 930 Cr) of the project cost of 13,334 Crores. When Project was revised double to Rs 24,664 Cr, implementation charge was frozen to same 930 crores, now just half (about 3.75%). Implementation cost should have been revised to 1850 crores from 930 crores but Govt compelled BSNL to complete the project without any hike in the implementation charges. The Govt projects gives an impression to the public that the entire public money goes to BSNL as grant or financial assistance but the fact is just the reverse. The statement made by our Hon Minister is also on the same lines, giving an impression that all this money is given to BSNL as financial assistance by the Govt. DoT compelled BSNL to act as a vendor for implementing the Govt projects, instead of focusing as a Telecom Service provider. 8. Tower Subsidiary formation: The Govts decision to form Tower Subsidiary Company is another move to weaken BSNL by taking away the BSNL assets and potential revenue earning wing of BSNL. It is part of a larger conspiracy to disintegrate BSNL into smaller entities like Optical Fibre Corporation, Land asset monetization etc etc and ultimately sell out BSNL and retrench the employees. 9. Charging of excess Pension Contribution. Non refund of i) excess Pension Contribution of Rs 2100 Cr and ii) penal interest on BWA spectrum refund (Rs 2360 Cr) and iii) other amount due for BSNL: DoT is deliberately taking the pension contribution on the maximum of the pay scales irrespective of DoP&T order against that. The penal interest for delay in refund of BWA spectrum charges after its refund also is a huge amount. All together, total amount comes to around 6,000 Cr which is not paid by DoT to BSNL and is starving BSNL. 10. Non-granting of permission for Bank loan etc. BSNL is the only operator given real challenge to Reliance Jio. DoT is deliberately not allowing BSNL to expand and maintain the network by capital infusion or by availing bank loans as done by other operators. Lakhs of Crores of loan is availed by Private Operators to expand their network. Upto 2017-18, total bank loan for Telecom sector is more than 6.1 lakh Cores in which BSNL share is just 11,500 Crores, less than 2%! Huge investment is required in Transmission network, mobile network and EB segment to compete with other operators. Without new Technology, BSNL cannot compete with others. DoT is creating industrial unrest and making BSNL sick intentionally to help other operators. 11. Commercial utilization of the land atleast to Govt/PSUs. All the business proposals from BSNL are negated by DoT. Proposals delayed are proposal denied and BSNL lost the opportunity. BSNL submitted a land management policy in July, 2018 to DoT for the effective utilization of its land assets and its monetization. BSNL is having about 800 Cr businesses in its hand already and has the potential to generate another 4000 Cr to 5000 Cr revenue from this proposal alone. However DoT is not approving the proposal which is having such a huge potential. 12. IMG bailout of private operators: The Inter Ministerial Group (IMG) formed by the Govt to bail out the private operators handed out huge concessions to them. The IMG made the recommendations in record time and Union Cabinet approved the recommendations even without assessing the losses which the exchequer will incur. As policy concessions having thousands of Cores implications, Govt extended the repayment period from 10 years to 16 years, Penal interest slashed from 14% to 10% and license fee etc slashed from 7.5% of AGR to 4.5 %. At the same time Govt is not giving any support to its own PSU, BSNL, let alone concessions! No 4G spectrum, no permission for bank loan, no permission for land and asset monetization, not filing crucial Director posts etc. 13. Non implementation of 3rd Pay Revision and pension revision not done to create industrial unrest in the company: Entire Telecom sector is under stress, BSNL which is operating in uneconomical areas cannot be an exception. 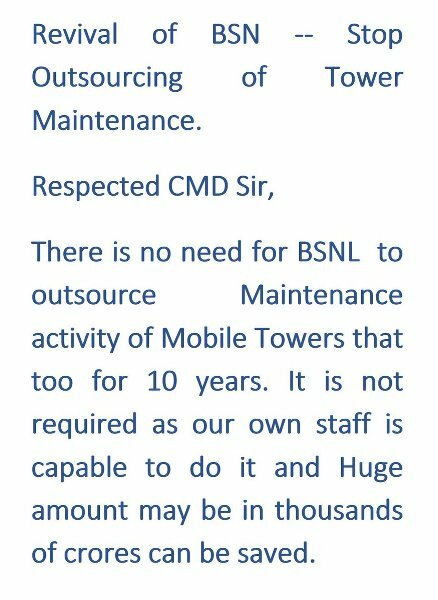 BSNL employees are not responsible for the present financial condition. BSNL employees are eligible for pay revision as in the case of Govt /Bank/insurance etc employees. On the 3rd Pay revision for the CPSUs, it is very relevant to mention that 7th CPC report is implemented for all the Central Govt employees without considering profitability or affordability. There are very sound, irrefutable, legitimate and justified reasons for the Govt. to treat BSNL on a different footing and exempt it from the affordability clause. In the case of BSNL, manpower cost should not be linked with profitability or affordability. Almost 70% of BSNL employees (1.34 lakh out of 1.71 lakh) are Govt employees absorbed from DoT into BSNL. After BSNL formation, BSNL has paid about 1.8 lakh Crores as salary to its employees from its own resources, without Govt support and saved that much money for the Govt exchequer. If BSNL was not formed, the entire financial burden of pay and pay revision would have had to be borne by the Govt. Now the employees are treated as liability by the Govt. But the same employees, with an additional one lakh, made Rs 10,183 Crores profit during the year 2004-05! It is not the employee cost, the revenue has come down drastically, mainly due to the Govt policies and mismanagement, that is the fact. Had the revenue increased proportionately, this crisis would not have reached. BSNL pensioners are Govt pensioners under Rule 37A, governed by the same CCS Pension Rules, 1972 where the pension is paid by the Govt. The pension revision for the Central Govt Pensioners made as on 01.01.2016, creating an anomaly with BSNL pensioners. Last pension revision for BSNL pensioners done through a Cabinet decision, setting a precedence. BSNL viability or affordability is not applicable for the pensioners. Govt. is deliberately denying Pay Revision and Pension Revision to create industrial unrest in the company and thereby facilitating growth of other operators. 14. All new businesses are given to the Reliance –Jio: It is a known fact that Govt machinery is misused in favour of Reliance Jio. The services to Railways, Banks, Airports etc where BSNL service was provided earlier is moved to Reliance Jio. All these cannot happen without the knowledge of the Govt and BSNL is the victim. 15. Settlement of left out issues of 2nd PRC. Non settlement of issues like E2/E3 pay scales, 30% Superannuation benefit to BSNL rects are clear indications where the industrial unrest and demoralization of the employees is being intentionally created with ulterior motives of destabilizing and completely jeopardizing the growth of the Company. Comrades, this kind of gravest ever crisis that the Govt. has created only with sinister motives to promote R Jio and that threatens to tear the company into pieces has to be met with never before seen kind of determination, commitment and conviction to hit and fight back. This is not the time where this and that has to be analyzed and reckoned. This is the time when we have to rise above all considerations of this and that. This is the time when like a rock we have to stand and withstand this endangering hurricane. When our bread and butter and the livelihood of our families are endangered, we have just nothing to be scared of or loose. Human endeavour, commitment and determination has created miracles and when our very existence is gets perished, the only way out is to fearlessly, ruthlessly and courageously wage a war and the present situation is nothing but a war like situation. And if that means taking the war to the doorsteps of the PM, we have to take it. There is no other option. Just get ready for waging that war which is going to be protracted and deadly. It does not matter what happens to us because we are already sunk deep into waters, whether we get killed or emerge victorious. We have no other choice. 13.03.2019 As per AUAB call we will be starting the social media campaign shortly on REVIVAL OF BSNL through Twitter to PMO, narendramodi, manojsinha, CMDBSNL, DoT etc. A Twitter account @savebsnlindia is created for that. As a BSNL employee and well wishers, we have decided to raise our issues through social media platforms too. We seek your cooperation regarding the same and please spread it to every nook and corner of the country. Give maximum publicity and create accounts for the employees and their family members and relatives also. All CSs, CHQ OBs should ensure that re-tweet is done by all Executives, Non- Executives, our family members, friends, our franchisee sales teams as guided and ensure that daily more than 25000 re-tweets is being done. Procedure is given below. 02.03.2019 As per call given by AUAB launch hour demonstration was conducted at circle office as well as SSA headquarters in protest against the non-payment of salary for the month February 2019 by BSNL and demanding the DoT, to immediately grant sanction to BSNL, for taking bank loans. Comrades of All Unions and Associations participated in this demonstration. At circle office ,Vijayawada Com. J Umamaheswara Rao CS SNEA, Com P. Asoka Babu CS BSNLEU and Com CH Chandrasekhar CS NFTE and other leaders of AUAB addressed the huge gathering . SNEA AP congratulate the comrades who participated in the Launch hour demonstration and made it grand success.